Enjoy tender perfection with our BBQ Grilled Ribs Recipe. 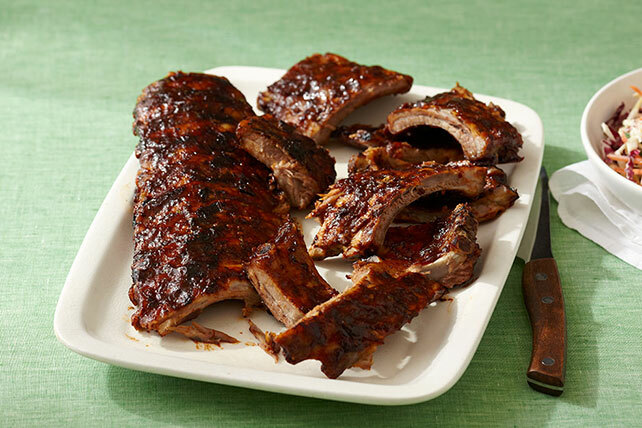 Our BBQ Grilled Ribs Recipe is perfected with a chipotle and orange barbecue sauce. Your next barbecue is sure to be a super success with this handy recipe at the ready. Place half the ribs in single layer on large sheet heavy-duty foil. Bring up foil sides. Double fold top and one end to seal packet. Add 1/4 cup water to packet through open end. Double fold remaining end, leaving room for heat circulation inside. Repeat to make second packet. Grill 45 min. to 1 hour or until ribs are done. Meanwhile, blend remaining ingredients in blender until smooth. Remove ribs from foil; discard foil. Return ribs to grill; brush with sauce. Grill 15 min., turning and brushing occasionally with sauce.